Price is dependent on a few things. The main thing is location. I currently charge $150.00 to tune a piano in the Townsville region. This will have me at your house for an hour to an hour and a half. Small issues will be repaired in this price as well. This can include lost motion in the action. Also some cleaning & pest control as well. If travel involves an hour round trip, there is an extra $50.00 charge. For example, a trip to Kelso or Bluewater from where I live is an hour round trip. 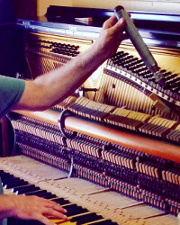 It is impossible to tell over the phone what may be wrong with your piano. I can give a rough estimate from the things you tell me but this doesn’t always go to plan. A good idea is to email me some pictures of your instrument with the front door and fall removed. This is a great way to start as I can sometimes see what might be causing troubles. I may still need to visit and see your piano. Is your instrument a pianola? Are there notes not working? This may incur extra costs as the complete pianola action will have to be removed to do repairs to the piano action and / or keys. I can also appraise your instrument for sale. There is $100.00 charge for this service. You will receive an honest, written appraisal and anyone who wishes to buy your piano may feel free to call me. Cash is my preferred payment option but bank transfer is fine as well.